What do you do when lunch plans with a friend fall through? Guilt trip your husband into meeting you instead? Really? That’s exactly what I do too! 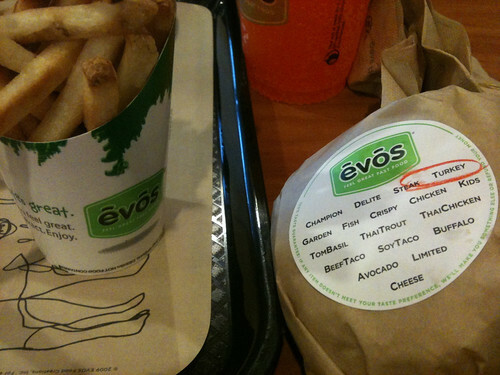 I was supposed to meet my friend at EVOS, which serves “healthy” fast food, meaning nothing is fried and the ingredients are supposed to be more wholesome. We have a couple locations in Atlanta and I’ve been to both several times. Since I was without a lunch partner and I’d been looking forward to eating here, I got Mr. Spice to meet me for lunch instead. The menu has a pretty good selection: burgers, wraps, salads, shakes, and some other fun stuff like airbaked chicken strips. I’ve had the steakburger, turkey burger, chicken strips, fries, and shakes and they’re all good. 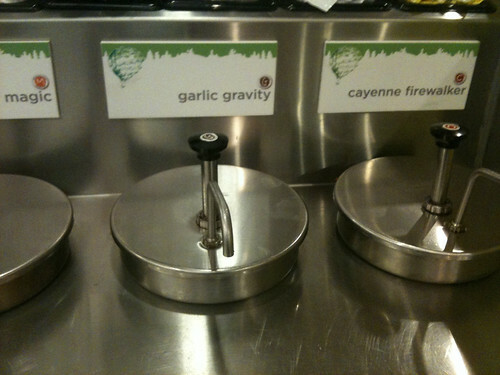 Surprise, surprise, I like the cayenne and garlic ketchups the best. Although I tried the mesquite today and it wasn’t bad at all. Today I decided on the chipotle turkey burger and airfries. 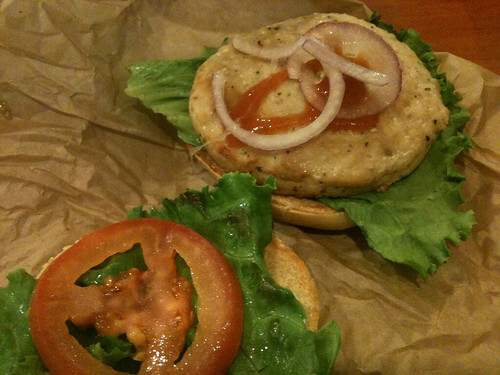 I got them to leave off the mayo and I put some hot sauce on my burger instead. See that? Those are REAL veggies on my burger. Real lettuce, tomatoes, and onions. None of that anemic looking crap you get at other places. This was Mr. Spice’s first time at EVOS. He got a steakburger and airfries and said it was a nice change — not greasy at all. That is exactly why I like coming here. No feeling guilty, greasy, and bloated after eating. See how happy I am to be on a lunch date with my hubby? A friend of mine has started her own blog! 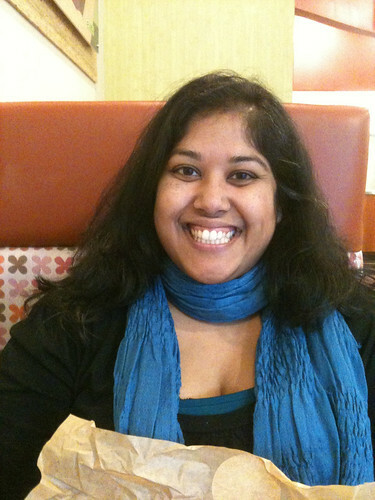 Sree’s blog saagAHH covers Indian food and Indian restaurants in the LA area, among other things. Brandi of BranAppetit is hosting a Sokenbicha tea giveaway! Tina of Trading Up Downtown is hosting a Peanut Butter & Nutella giveaway! 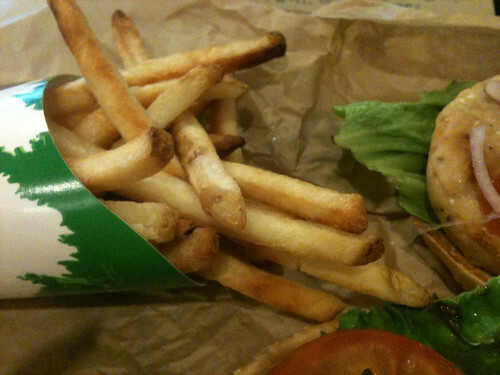 Air baked fries? I have never heard of such a thing but it sounds absolutely amazing!! I haven’t forgotten about a list of places near the airport – I will email it to you soon. I’m off to check out your friend’s blog! 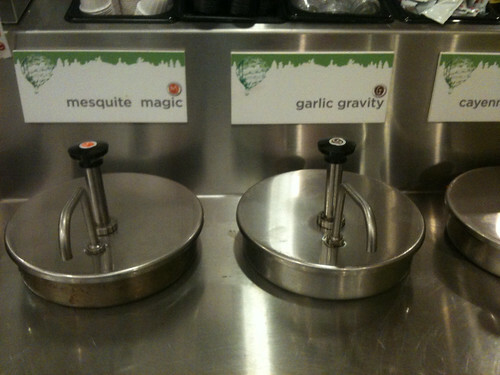 This looks like such a yummy place. 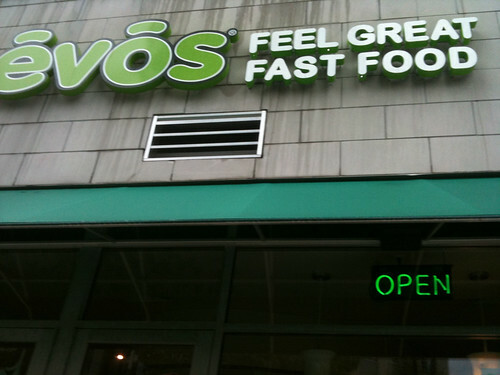 I love the concept of guilt-free fast food. Wish we had one in our city! @Ameena — they’re so good! @Theresa – it is such a great concept, I hope they expand more. And it turns out that the day we went was the last day this location was open – it shut down the next day. No wonder it was dead in there!